Dis movie nowhere near fantastic but, all in all, not de worst fan film monster have ever seen. De skript be cliche and contrived, de akting hokey and over-de-top, and de special effekts soooo cheezy, but you have to remember dat dis movie not made by profeshiunals. It a produkt of love by group of people wit absolutely no experience making movies and even less money to…wait. What? WHAAAAT?! Dis NOT a fan film? Okay, apparently dis a real movie. Or is it? It was made for 1.4 million dollars. Direktor and aktors were told it was real. But producer only made movie so he would not lose rights to Fantastic Four. Movie never released and producer went on to make bigger budjet Fantastic Four movie in 2005 (which monster hear be not dat much better). Dat explain A LOT. Reed and Victor, BFF. Or, as slashers call dem, “Mr. FanDoomStick”. Experiment not exactly smooooth sailing. Lab blow up. Victor badly injured! Reed go to visit him at hospital but creepy Borat doktors tell him dat Viktor dead. BUT it turn dey not just your run-of-de-mill creepy Borat doktors. Viktor still alive and dey kidnap him! Why? Who are dey? Audience never find out. Mebbe we have to wait for direktor’s cut. Ten years later, Reed and his buddy pilot Ben plan to fly into space and harness power of…COLOSSUS! (Please do not try dis at home!) On way to outerspace, dey drop by home of friends Sue and Johnny Storm and invite dem to join. Why? Sure, dey may not have proper astronaut training, but Reed not want to make dem feel left out. Even tho he not seen dem in 10 years! 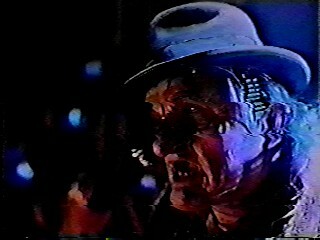 Check out de low rent Freddy Kreuger. Meanwhile, really lame charakter called De Jeweler (who live underground wit fellow hobos who akt like dey in a children’s theater produktion of Oliver Twist), fall in love wit blind sculptor, Alicia, who in love with Ben after he bump into her, destroy her art, den lift her up off her feet and proklaim: “You’re safe wit me!”. What a douche. Jeweler decide to steal a diamond for her, de biggest diamond he know – which happen to be what Reed will use in his spaceship to harness de power of…COLOSSUS! (Did me mention you shouldn’t try dis at home?) Anyway, diamond kept in high-security laser-protected lab – which, apparently, can be beaten by a good game of hopscotch. Jeweler steal diamond and switch it wit fake. As a result, space mission not exaktly go as planned. 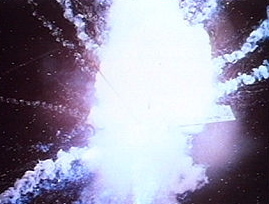 Ship blow up in space! Spektacular visual effekt compliments of tin foil and some firecrackers. Crazy 70′s kaleidoskope effekts! Somehow, pieces of ship and all four crew members (Reed, Ben, Sue, and Johnny) survive re-entry and all land in de same place. Turn out dey all have superpowerz! Johnny can make fire! Reed be stretchy! Sue can go invisible! In one of best scenes in movie, military arrive and talking to Reed when Ben show up. Everyone shocked except Ben who, for some reason, not even happen to notice he turned into…A BIG ORANGE ROCK MONSTER! Johnny have de hot hand. Heh. 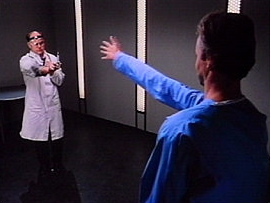 Military take dem to lab where goofy doktor examine dem. Nyuk nyuks ensue. Thing sit and break chair. Johnny scare doktor with flame. Sue startle doktor and cause him to stick hisself wit needle. 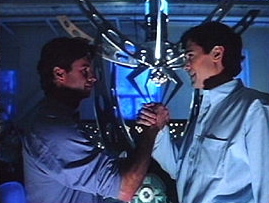 Reed uses stretchy arm to take needle from doktor. Ho ho ho! Can’t wait for de urinalysis. Fantastic Four (dat what Sue and Johnny’s mom call dem) get suspishus. Click-click-click-click. “I am Doom. Moohoohahahahahahahahahaha!” Click. Dr. Doom walk around in metal suit and green robe. His voice sound like he in a tin can somewhere in de next room (monster guess produktion couldn’t be bothered to bring aktor in for dubbing). He always tapping his metal fingerz, click-click-click-click-click. And laughing in good ole’ cheezy superillain fashion: “Moooohoooohahahahahahahahahahaha!”. At least he have positive attitood. FF eskape. Bullets bounce off Thing. Reed (aka Mr. Fantastik, aka Stretchy Stretcherson) stretch out his leg and trip every soldier running into room. EVERY soldier. Dey just trip right over his leg and knocked unconscious by fall. Uh, waitaminute. Isn’t Alicia blind? Dr. Doom plan to use diamond to power laser he will use to destroy New York! 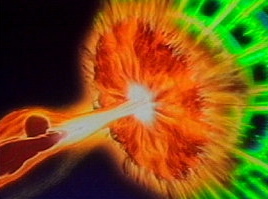 He send Reed proof: stock footage of nuclear blast blowing away house. Fantastic Four go to Doom’s hideout in new outfits Sue sew for dem (Dat a girl!). But dey get trapped in forcefields! Reverse force field allows prisoners easy access in AND out! But not very good forcefields. For some reason, Reed able to stretch his leg out and kick over laser. Yep. Just kick it over. Explosions! FF is free! But laser already fired at New York! No problem. Johnny turn into Human Torch and chase it down. For real. Laser traveling at SPEED OF LIGHT! And he still catch up! At dis point, movie turn into cartoon. Human Torch save de dey. 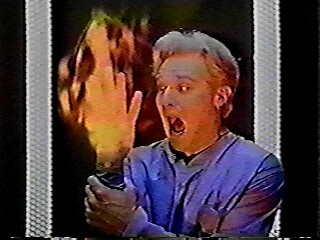 Human Torch save de dey, Hanna Barbera style! Reed chase down Dr. Doom. Fight! Doom hanging off building and ask Reed to help him. Reed reach out – at which point Doom give de old “You don’t have what it take to kill me!” speech. Doom lose his glove and disappear into de cloudz below. Cloudz below?! How high up are dey?! Hurray! Johnny save New York from laser! Reed defeat Dr. Doom! Thing beat up all de Doom Trooperz! And Sue sewed de nice outfits dey’re wearing. Dat’s team work! Happy ending! Reed and Sue get married. In deir costumes for some reazon. 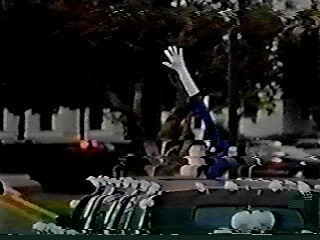 Dey get into car and, as dey drive away, Reed stretch out his arm and wave bye bye. Bye bye, wedding guests! Bye bye, viewers! Bye bye any chance of a sequel! 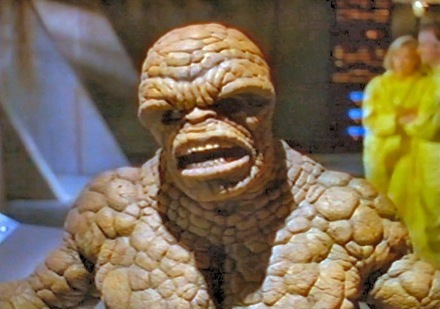 Verdikt: If Fantastic Four taught monster anyting, it dat crappy moviez be crappy moviez, but crappy superhero moviez be de crappiest of all! Also, apparently most homeless people be failed Shakespearean aktors. Rating: 1 chocolate chippee cookie earned by costume department.